Who is "Tokyo Rose" and her trial of treason? A scene from Zero Hour: Tokyo Rose's Last Tape. Photo by Ayumi Sakamoto. BOTTOM LINE: The case of Tokyo Rose and the Zero Hour Radio Tokyo program reimagined by visual artist Miwa Yanagi. Miwa Yanagi uses a minimal, white canvas. It begins with sounds, music and voices coming from 1940s radios..."Can you hear me?" "Can you hear me now?" Five women repeat these phrases, dressed in neat white blouses and mid-calf length black skirts, a black cloche hats that cover up their eyes, revealing only their perfect red lips. Their perfect voice is broadcasted over the radio. Black against white. Uniformed and doll-perfect. Which one of them is Tokyo Rose? She has committed treason for broadcasting Japanese propaganda to U.S. GIs in the Pacific. During WWII the Japanese broadcast an English-language radio program hosted by a rotating roster of female voices. In between coy "updates" on the war such as insinuations of Japan's impending attacks, the show played the hit songs of the day. It was extremely popular among American serviceman. Similar programs were employed by other Axis countries, but Radio Tokyo's sweet voice and romantic tunes were much favored during the brutal war. "Tokyo Rose" was the generic name given by Americans to all the announcers. In reality, there were as many as 20 announcers on the program. After the war, in 1949, Iva Ikuko Toguri, a young Japanese-American typist, became the seventh person in the history of the United States to be convicted of treason. She longed to return to her homeland, and adamantly kept her American citizenship while stranded in Japan after the Pearl Harbor attack. When she was finally brought back to America, she was arrested and tried for treason. She remained in prison until 1956. Thirty-one years later, President Gerald Ford pardoned her; as many Americans realized by then that she was not guilty. In Yanagi's theater piece, the story skips forward in time to 2006, the year Iva Toguri dies, and back to 1943. There are two dominant male characters, Daniel Yamada (performed by Yohei Matsukado) as the Japanese-American officer investigating the case, and Toshiya Shiomi (performed by Sogo Nishimura) as the radio program's technician. They continue an ongoing dialogue for the audience, up to the year 2006, with Daniel trying very hard to solve the whodunit. Meanwhile, most of the women are typists or language transcribers born in English-speaking countries, forced to become announcers by the request of the radio station (run by the Japanese Imperial Army). They appear identical and anonymous when they wear their cloche hat, but occasionally, they take them off, we see them as individual characters. They also take on multiple characters' voices as the story unfolds. 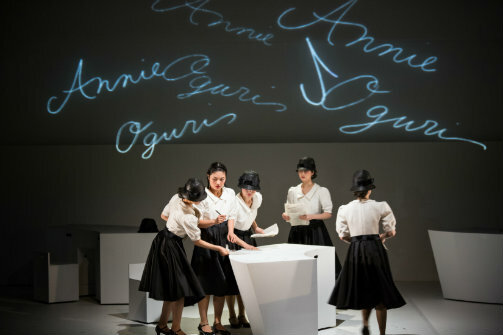 Sounds, voices, movements and choreography (choreographed by Megumi Matsumoto, sound designed by Yasutaka Kobayakawa) are continuous and underlay the dialogue. This is a visual play, where the picture perfect scenario tells a gruesome story of its own: women trapped between the countries during a war, and women trapped in a patriarchal society, where they are pawns in a game played by men. Iva Toguri became a scapegoat and victim of her times. It seems natural that Ms. Yanagi would make the jump to create a piece for theater. Her "Elevator Girls" photography series started as a performance art piece, and later in "My Grandmothers" series, each of her photographs are accompanied by a script, where she interviewed 14 and 20 year old women to imagine their life 50 years later. This New York premiere marks Yanagi's North American debut in theater. The show, produced and organized by Japan Society, will go on tour to Washington D.C., Towson (Maryland), Toronto, and finally Los Angeles, where Iva Toguri was born and raised. Japan Society in New York launches Stories from the War with this production, and the series runs through August, marking the 70th anniversary of the end of WWII with programs including a theater series, film series, lectures and education programs.